Are you interested in the nuts & bolts of food and nutrition? Consider a career as a nutritionist. After assessing a patient’s current diet, nutritionists spot dietary deficiencies and come up with remedial meal plans. Their main objective is to help patients reach optimal health through food. Whether they’re interested in the biological basis of how food works in the body. Grab a banana (or carrot, whichever you fancy), and follow this Land Your Life career guide to successfully pursue your dream of becoming a nutritionist. Nutritionists come in different forms, but they’ve all studied nutrition at some point in their lives. According to the U.S. Bureau of Labor Statistics (BLS), most nutritionists earn a bachelor’s degree in health, dietetics, nutrition, or a related field. These programs typically take 4 years to finish and nutritionists often complete a supervised internship during or after their undergraduate years. Some states require dietitians and nutritionists to be licensed, while others only require state registration or certification. Aspiring nutritionists should check their state’s regulations and requirements to plan accordingly. While being registered isn’t a requirement, many nutritionists work to become a Registered Dietitian Nutritionist (RDN) by completing several requirements. Most states regard RDNs as having met their state specific requirements and regulations. To become an RDN, aspiring nutritionists must have completed a bachelor’s degree at a U.S. regionally accredited university or college and coursework accredited by the Accreditation Council for Education in Nutrition and Dietetics (ACEND®). Courses may include chemistry, nutritional biochemistry, and human physiology, to name a few. Aspiring RDNs also need to complete ACEND®-accredited, supervised practice programs that typically run for 6-12 months. These programs are much like internships. You can complete them during or after college. Finally, aspiring registered nutritionists will need to pass a national examination administered by the Commission on Dietetic Registration (CDR), and complete continuing professional education requirements in order to maintain their registration. While nutritionists don’t need to become registered dietitians, aspiring nutritionists should keep in mind the benefits of becoming an RDN. According to the U.S. Bureau of Labor Statistics, employers prefer hiring RDNs. Nutritionists advise patients on good food choices and the consequences of unhealthy eating habits. They treat and prevent illnesses by helping patients ease into individualized meal plans. They also regularly check up on patients to provide encouragement and document any progress made. Nutritionists, like all health professionals, have to be extremely knowledgeable practitioners. They stay on top of current nutritional research and understand the reasons behind people’s unhealthy eating habits. This information allows nutritionists to effectively update meal plans, based on new findings, and tailor meals to cater to patient’s preferences and financial restraints. Nutritionists have a very important role to play in the United States, especially since there’s a growing, nationwide concern about the obesity epidemic. The Centers for Disease Control and Prevention report that more than one-third of U.S. adults are obese and more than one-third of children and adolescents are overweight and obese. Overweight and obese individuals are at high risk for heart disease, diabetes, and stroke. People can prevent these diseases through proper nutrition. What Does an Average Day For A Nutritionist Look Like? Nutritionists will often start their day by checking emails. Since they’ve subscribed to several medical journals like the Annual Review of Nutrition, The American Journal of Clinical Nutrition, and/or the Nutrition Research Reviews, they expect to be notified of any new research that has come up. Nutritionists also use this morning time to follow up with their patients. They receive several emails from patients, who have specific questions about meal plans, new studies, and even celebrity diets. It’s up to nutritionists to thoroughly answer questions, dispel myths, and provide patients with accurate, up-to-date information. One-on-one interactions with patients comprise the bulk of a nutritionist’s daily responsibilities. They go over medical histories, build rapport with patients, and provide emotional encouragement. They then discuss their patients’ dietary deficiencies. During these conversations, nutritionists take their patients’ interests into account. For instance, some patients want to lose weight while others may be battling a food allergy. It’s up to the nutritionist to address their patients’ concerns during these one-on-one appointments. Unless nutritionists are consultants or own a private practice, they’ll most likely coordinate the implementation of meal plans with other specialists. For instance, if nutritionists work at a hospital, they would need to coordinate with doctors to ensure patients’ medical needs don’t conflict with designed meal plans. If they work at a school, they’d need to interact with cafeteria staff and students’ parents to adequately implement meal plans. Coming up with a meal plan is no easy feat. Nutritionists have to consider their patients’ dietary preferences and restrictions to ensure their patients can stick to the new regime. Patients also come in with different needs. Some come in to improve their fitness level or endurance level, while others may have just realized they’re allergic to a certain food. Additionally, patients come in with varying socioeconomic statuses limiting the kinds of foods they can afford. Nutritionists need to factor in all of these different components before designing a meal plan to satisfy their patients’ preferences, needs, and wallets. Nutritionists will often have other roles besides their main source of income. They may work with a company to endorse a healthy product or write for different publications to share facts about nutrition. They may even perform guest lectures at speaking engagements to promote nutrition and healthy relationships with food. Planning for or executing these other roles can take up some of a nutritionist’s day. Are You Suited for A Nutritionist Career? Nutritionists possess certain qualities that make them great at what they do. Most nutritionists have good people skills. Since nutrition is a people-oriented business, nutritionists must be sympathetic listeners, who can understand their patients’ problems and provide trusted counsel. They also must have great communication skills in order to adequately communicate solutions, so their patients understand, grasp and can implement meal plans. 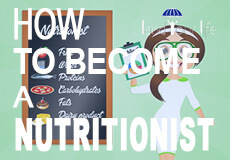 Nutritionists are organized individuals with analytical skills at their disposal. Seeing a diverse range of patients with different problems and dietary needs requires organization skills and a keen attention to detail. They’ll need to consider their patient’s risk factors, genetics, and past diagnoses before designing meal plans. Their analytical mind allows them to factor in new research before deciding upon the best possible meal plans for their patients. Nutritionists are also very knowledgeable health professionals. They are on top of the latest news in nutrition, like food production issues and costs of food. They also understand the intricacies behind the human body’s ability to absorb nutrition. Nutritionists can undergo a series of requirements to earn the Registered Dietitian credential and become Registered Dietitian Nutritionists (RDNs). While not required, some RDNs opt to specialize in certain areas of practice. Areas can include sports dietetics, diabetes education, and other nutrition-related fields. Employers prefer registered dietitians for nutritionists, but individuals can opt for board certification instead of becoming a registered dietitian. They can take the Certified Nutrition Specialist® (CNS®) exam to show advanced knowledge in nutrition. In order to qualify for the exam, nutritionists must complete a master’s or doctoral degree in nutrition or clinical health care and 1,000 hours of supervised experience. As far as proficiencies go, nutritionists have to be proficient in certain types of technology and software. They use nutrition-based software to design meal plans and they use equipment like calorimeters, which measure metabolism, and glucose meters, which measure blood sugar levels. Nutritionists need to be trained in order to be proficient in these key technologies and computer software. How Does a Nutritionist Find Work? About 11% of nutritionists work for themselves, while the majority work in hospitals. Supervised internship programs allow nutritionists to make connections and network with potential employers. The contacts made through internships are great resources to discover job openings. Generic job search tools also provide plenty of applicable job posts. But the best way to find a job is to join professional affiliations. There are several professional affiliations that provide exhaustive job databases. The Academy of Nutrition and Dietetics, for instance, offers career resources for registered members. These resources include job search functions and job alerts from hiring hospitals, clinics, and university-based programs. In 2017, the U.S. Bureau of Labor Statistics (BLS) reported that nutritionists earn a median yearly salary of $59,410, which is about $28.56 per hour. The top 10% in the field make about $83,070 per year while the bottom 10% make, on average, $36,910 per year. The top five paying states for nutritionists are California, Alaska, Oregon, New Jersey, and Connecticut. There are a few ways to increase one’s chances of reaching the higher end of the salary range. One primary tip is to register and become an RDN, since employers prefer or require the Registered Dietitian credential. Another great tip is to seek out additional roles outside of a primary position. Nutritionists can contact publications to write a nutritionist’s column or accept opportunities to endorse products from companies, who’ve come out with new lines of healthy products. Nutritionists should also seek out business and management roles. RDNs in these management and business roles have reported earning annual incomes above $90,000. The employment of nutritionists is projected to grow 15% from 2016 to 2026. This growth is due in large part to the growing concern over the country’s obesity epidemic. Additionally, the United States is focusing its priorities on disease prevention, proper nutrition, and providing care to the growing aging population. Work as part of a health care team to treat patients. Nutritionists in these jobs educate patients about nutrition and implement effective meal plans. Some nutritionists take on managerial roles, supervising staff and overseeing the institution’s food preparations and services. RDNs are suited for these positions, especially individuals with experience in health care facilities. RDNs with managerial and communication skills are preferred as they must be able to work effectively in teams in order to excel in these positions. Educate clients about proper nutrition and how to achieve optimal health and fitness goals. Nutritionists who are RDNs are suited for the position, especially candidates who have sought further specialization in sports nutrition. Nutritionists in these positions should have a keen interest in sports, athletics, and fitness. They must also have a minimum of two years experience. Salaries vary according to location and the experience level of the applying candidates. Work in communications, product development, or consulting with cafeterias, chefs in restaurants, and culinary schools. Nutritionists in these jobs are expert advisors who work on a consulting basis to help third parties implement proper nutrition into their programs. RDNs are suited for the position, especially nutritionists with people skills and communications skills. Work for a private business or as a consultant for health facilities. Nutritionists who work for a private practice provide counsel to different clients, including restaurant managers, athletes, and nursing home residents, to name a few. RDNs are suited for the position, especially if they have several years experience under their belts. Advise the public on ways to improve their food choices and lead healthier lives. Nutritionists who work as part of a local government usually have an overarching goal in mind, like reducing the community’s obesity rate. RDNs are preferred for these roles, especially when they have experience in helping groups of people accomplish their nutritional goals. RDNs with great communication skills and an understanding of their local community’s health issues are suited for the position. Teach dietetics students, physician’s assistants, nurses, and other health care professionals the science behind nutrition. RDNs are suited for the position, and particularly candidates who have experience in the field. RDNs must have great communication skills in order to clearly teach dense material.